This Expert Guide gives you the techniques and technologies in embedded multicore to optimally design and implement your embedded system. 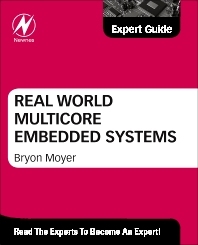 Written by experts with a solutions focus, this encyclopedic reference gives you an indispensable aid to tackling the day-to-day problems when building and managing multicore embedded systems. Following an embedded system design path from start to finish, our team of experts takes you from architecture, through hardware implementation to software programming and debug. Bryon Moyer is a technology writer and an editor/writer for EE Journal. He has over 25 years’ experience as an engineer and marketer in Silicon Valley, having worked for MMI, AMD, Cypress, Altera, Actel, Teja Technologies, and Vector Fabrics. He has focused on PLDs/FPGAs, EDA, embedded systems, multicore processing, networking protocols, and software analysis. He has a BSEE from UC Berkeley and an MSEE from Santa Clara University. Principal, Moyer Consulting, Santa Cruz, CA, USA.